We live in the age where words such as “hashtag” and “lol” have started to exist outside of digital screens and are being used in oral speech. It has also become the age of optimal creativity. Take our weddings, for example. We no longer want to get married in a traditional fashion and surely don’t want to tie the knot with just a simple ceremony. Additionally, there is a certain craze going around that assigns weddings their own ceremony-specific labels. Yes, I am talking about the wedding hashtag fad. Regardless of race, region or culture, weddings around the world have transitioned from being just religious, auspicious ceremonies to a time of quirky fun. Happy couples and their families and friends go all out in etching the memorable event into their personal histories. What could be more personal or ultimately unique than a customized hashtag? It’s quite a novel idea actually. 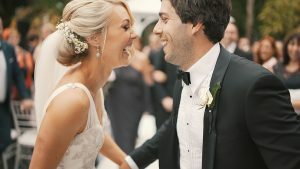 Usually the wedding hashtag is a conjunction of the bride and groom’s names or surnames or a mix of either, which catches on during the time of festivities. I suppose it’s easier to refer to them using one word as opposed to calling them by their birth names. So the trend could have caught on for multiple reasons: convenience, fun, cheesiness or maybe even to get solid Instagram discovers. Will we ever know? These hashtags have come to be the modern-day wedding norm and have taken over not just the wedding’s digital platform but also the entire décor. You’ll find everything from the invitations to the table napkins, bachelorette gift bags and even photo booths adorned with the couple’s carefully selected, witty name. Here comes the mind-boggling bit. There is actually a lady who has made a side business of hashtagging for people’s weddings! Los Angeles based magazine editor Marielle Wakim is squeezing out her creative juices to take the stress off of hassled couples who obviously cannot be expected to come up with brilliantly quirky names for themselves on their own in the midst of approving cake flavors, invitation templates and bouquet flowers. Wakim charges a fee, of course; her packages start at a modest $40 and go up to $85, depending on the number of options and peculiarity the couple wants. Add this to the top 10 on the list of absurdly incredible job ideas. I am all for letting your creativity flow, especially if it’s for such a noble cause. After all, it’ll be such a shame if you don’t get to put up your wedding photo without the perfect hashtag on the frame. These things are memories, and no job can be more precious than helping people make the most of them.